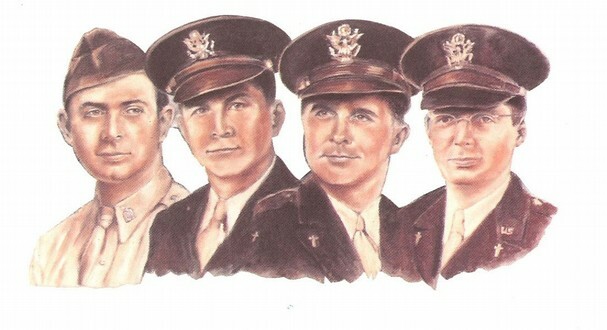 The Chapel of the Four Chaplains is a 501 (c) (3) non-profit that was created to honor the selfless sacrifice of four U.S. Army Chaplains who gave up their lifejackets when the troop transport U.S.A.T. Dorchester was sunk just ninety miles from Greenland on the morning of February 3, 1943. It is also important to remember that Rabbi Alexander Goode, Rev. George Fox, Rev. Clark Poling and Father John P. Washington (seen left to right) worked together as army chaplains, months before they made the choice to help others and pray together as the ship sank. In this spirit, the Chapel of the Four Chaplains advocates for cultural harmony and religious tolerance. It is comprised of community leaders, friends and corporate contributors. Donations are tax-deductible. More information about the Chapel can be obtained by on the website at www.fourchaplains.org or by email at chapel@fourchaplains.org.